During the 1960’s, America was undergoing drastic change and opposition when it came to the civil rights movement. Demonstrations were being made frequently, some peacefully and some not so peacefully. And everyone knows the name of Dr. Martin Luther King, Jr., the man credited as the champion of the civil rights movement for African Americans. 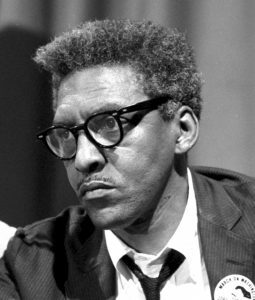 A name many people probably aren’t as familiar with, however, is that of one of King’s assistants and possibly the greatest influence on King’s nonviolent approaches to civil rights reform – Bayard Rustin. Born on March 17, 1912, Rustin was an advocate for civil rights and protested segregation in the military and in civilian settings. He was also a supporter of rights for the LGBT community, though there were complications in publicly disclosing his own sexuality until later on in life, entering into the 1980’s. Rustin was well-known for writing poetry as well his strong convictions regarding desegregation and nonviolent protest, as well as his unfortunate knack for being forced to leave causes which he had supported. He had been a supporter and member of the Youth Communist League, subsequently asked to leave due to protesting desegregation within the armed forces. He participated in the Journey of Reconciliation in 1947, only later to find himself on a chain gang after already serving 3 years in prison due to refusing service in World War II as a conscientious objector. He was also forced to resign from the Fellowship of Reconciliation in 1953 due to an alleged sexual act with two white men in an automobile – this after having joined the FOR 12 years prior. All of these acts had put Rustin on the FBI watch list, compromising his ability to perform for various groups at the time. Rustin was an outspoken believer in nonviolent protest, having attended a world pacifist conference being held in India in 1948. He was a supporter of Gandhi’s ideals and was determined to bring them back to America to implement them. He reached out and assisted Dr. Martin Luther King, Jr. in an effort to expand his resumé to peaceful protests before Dr. King was forced to part with Rustin due to threats of spreading rumors that Dr. King and Rustin were gay lovers. While Dr. King suffered a hit to his credibility, Rustin appeared unphased and continued his efforts through other avenues. Rustin ended up being recruited by A. Philip Randolph, who was attempting to organize a march on Washington in 1963. Reaching out to Dr. King again, Rustin helped form a coalition of several different civil rights reform groups for one massive march on Washington. And while he had to take a backseat due to his weight as a “liability” according to Roy Wilkins of the NAACP, the march was closer than ever to being underway. But Rustin and his credibility would be tested again, this time by Strom Thurmond who personally read from Rustin’s FBI file, which caused internal turmoil among the coalition heads that needed to be addressed. In the end, the march on Washington was a rousing success, even if it came at great personal cost for Bayard Rustin. And Rustin’s credibility would only continue to decline from there, as many claim he had begun to neglect the causes he had once tried so fervently to champion: hesitating to decry the war in Vietnam, alienating himself from “proponents of black power” by associating closely with the Democratic party, and cautioning Dr. King against speaking out at Riverside Church. Despite this, Rustin remained active in the pursuit of civil rights (and economic) justice, and even expanded his efforts internationally to the likes of Israel, Central America and Africa. In the 1980’s, only a handful of years before his death, Rustin came out publicly regarding his sexuality and urged others like him to do the same for the sake of civil rights aimed toward the LGBT community, as they had become the new standard for “judging the character of people in regard to human rights…” Rustin died in 1987, leaving behind a legacy of nonviolent protest and support for civil rights involving various and diverse social groups – and nearly all of it from behind the scenes.